The LM10011 is a precision, digitally programmable device used to control the output voltage of a DC/DC converter. The LM10011 outputs a dc current proportional to a 6-bit or 4-bit input word. 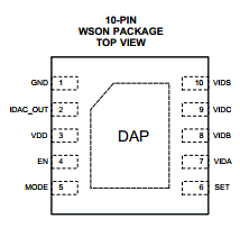 By connecting the IDAC_OUT pin to the feedback node of a regulator, the regulator output voltage can be adjusted to a desired range and resolution set by the user. As the input word counts up, the output voltage is adjusted higher based on the values of the feedback resistors in the converter.